Do You Know the Best Pool Cleaning Tips for the Arizona Heat? In Scottsdale pool cleaning is essential with swimming pool season being quite long. Warm temperatures can last from March through October so it’s important to know the best ways to maintain a clean pool so that you can enjoy the extended swim time! 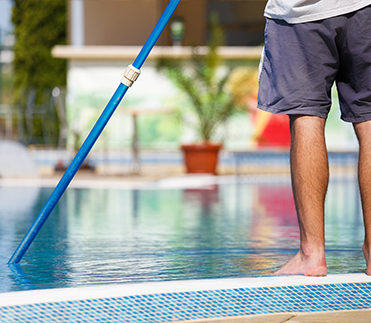 These pool cleaning tips are things you can do on your own but if it’s too hot in the summer or you don’t have the time, hire a professional pool service to complete them to ensure your backyard oasis is always ready to jump into. Skimming debris off the top of the pool water probably seems like common sense but you would be surprised that some pool owners will only do this right before they go swimming. It is important to skim the water at least a few times a week and especially after storms to avoid clogging your pool vacuum or pool plumbing lines and overworking your pool filter. A clean pool can only be achieved if all of its parts are working and water is free to flow through the filter and back to the pool. Not clearing out leaves or palm branches could lead to bigger issues like broken pool vacuums or pool filter repairs. So if you don’t have a pool skimmer net we suggest getting one and while you’re at it, grab a pool scrub brush as well because the next most important step you can take to keeping a clean pool is scrubbing your pool walls. Algae will grow and build-up on your walls if not scrubbed away so be sure to do this or ask your pool service to do it once a week in the summer and every couple weeks in the winter. We’ve had customers ask, well doesn’t the pool vacuum take care of that? Although it can sweep much of the bottom of the pool and may climb the walls, in reality, the pool vacuum doesn’t clean like the scrub brush will. If there are darker areas that you can see on the wall, be sure to put some extra elbow grease into scrubbing them to help your pool stay clean. The best sign of chemical balance in pool water is odorless, clear water that doesn’t leave residue on your skin. One of the worst feelings after swimming is getting out of the pool with burning eyes and itchy skin and this is a major sign that the pool chemicals are off balance. Summer heat in Scottsdale means that you will go through more pool chemicals during June, July and August so it will be important to check the chemical levels to make sure your pool water stays clean and clear. You may be wondering, ‘How can I test my pool water?’ and it’s super simple! Any local pool supply store will have testing kits that allow you to scoop a sample of your pool water into a vial and either put in a test strip or liquid drops to see the water color turn. Follow the instructions of the test kit and based on the color scale adjust your chemicals as prescribed. If you’re not comfortable adjusting them, your pool service technician can even test the water for you and get your pool chemicals back in balance so let them do the work for you! As you know, water evaporates quickly in the summer since Scottsdale temps are usually 100+ degrees so it is best to keep an eye on your pool water level. Your pool can’t stay clean if it doesn’t get fresh water and the pool pump and filter can’t run well without proper levels of water. We suggest keeping the water level at about halfway up the skimmer opening. In the summer be sure to add water from the hose every few days or more if it gets a lot of use. There are automatic water fillers available that will do the work for you so you won’t have to remember or a professional pool service can come once a week and not only adjust the correct water level but recheck the chemical balance and make additions as needed! Having a professional pool cleaning and maintenance company come once a year to inspect your pool and all the equipment is very important. They are trained to see things that are wearing out and can complete small repairs or replacements that may help avoid larger issues or costly pool repairs. As it heats up early this year in Scottsdale, we invite you to start checking your pool levels now or give us a call to inspect everything so you can be sure to start the swimming season off right! We are happy to help answer all types of pool questions so don’t hesitate to contact us anytime!